In only their fourth season together, the Jersey Shore Boca U23 women continue to re-write the Club history books as the Boca ladies finished another strong summer campaign together which ended Sunday afternoon on the campus of Ramapo College with a 1-0 win over the Quickstrike Soccer Club from New York and the capture of the Mid-Atlantic Summer Showcase League (MSSL) Cup for a second consecutive year. MAHWAH, NJ (July 25, 2010) – In only their fourth season together, the Jersey Shore Boca U23 women continue to re-write the Club history books as the Boca ladies finished another strong summer campaign together which ended Sunday afternoon on the campus of Ramapo College with a 1-0 win over the Quickstrike Soccer Club from New York and the capture of the Mid-Atlantic Summer Showcase League (MSSL) Cup for a second consecutive year. It is the first time in Boca’s thirty-two year history that women’s team of any age has captured back-to-back championships. 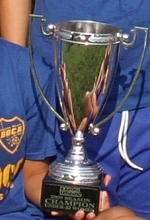 In 2009, the Boca U23 women defeated the Middlepath Soccer Club 1-0 to claim last year’s MSSL cup. 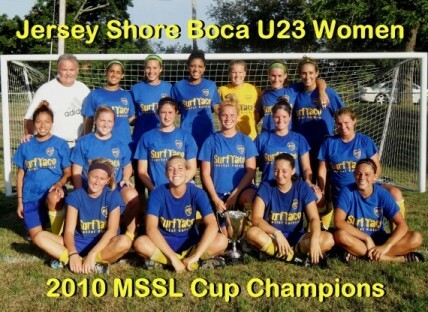 The Jersey Shore Boca U23 women’s team along with head coach Charlie Cunliffe poses with the 2010 MSSL Cup. The Boca women defeated the Quickstrile Soccer Club from New York 1-0 to claim the championship and the MSSL Cup hardware for a second consecutive year. The Boca women started this season’s Cup journey by defeating Randolph Celtic (NJ) 2-0 in a quarter-final match early on Sunday morning with goals from Katie Cornacchia (Scotch Plains-TCNJ) and former Wall High School standout Jen Pyne (Wall-Kutztown University). In the semi-finals, Boca shut-out Howell United (NJ) also by the score of 2-0 with Jackson native Brandi Johnson (Jackson-TCNJ) tallying the first goal followed by a converted penalty-kick from Carolynne Kahl (Tuplehocken-Kutztown University). In the MSSL Cup championship, Boca squared-off against a strong Quickstrike FC side that was undefeated during the regular MSSL league season. After a see-saw battle back and forth throughout most of the match, Boca tallied the Cup winner and on an unassisted goal by former Middletown North High School star and College of New Jersey sophomore Jessica Davila (Middletown). Lauren Albrecht (Marlton) was outstanding between the pipes for Boca on the afternoon. The former Cherokee High School standout and current FDU Florham junior goalkeeper produced several highlight-reel saves in route to her three shut-outs and the cup championship. The Boca U23 women are coached by long-time women’s soccer advocate Charlie Cunliffe, who has been at the helm of the team since their inception four years ago. Jersey Shore Boca participated in MSSL for the seventh consecutive year this summer as one of the league’s inaugural founding members.